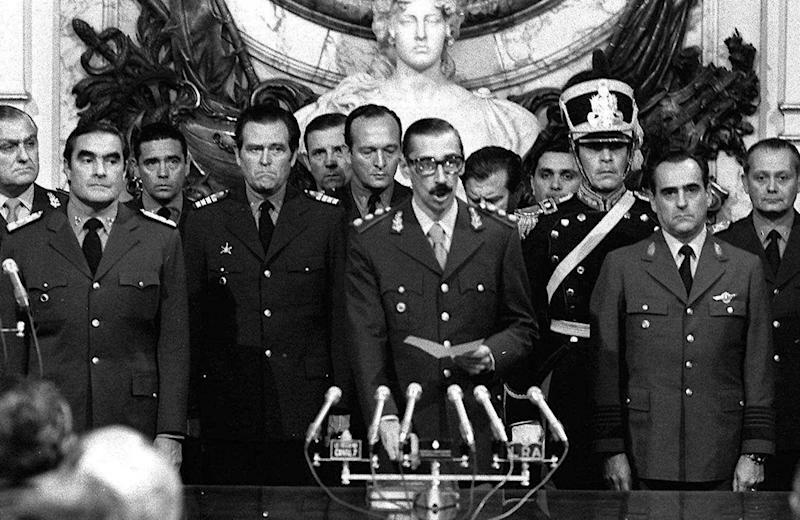 BUENOS AIRES, Argentina (AP) — Former dictator Jorge Rafael Videla, who took power over Argentina in a 1976 coup and led a military junta that killed thousands of his fellow citizens in a dirty war to eliminate so-called "subversives," died quietly in his sleep Friday while serving life in prison for crimes against humanity. He was 87. 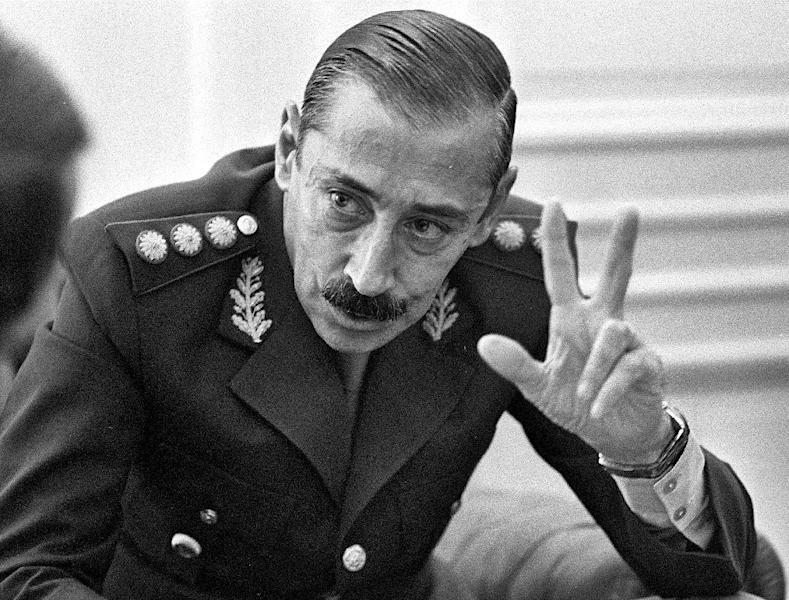 Federal Prison Service Director Victor Hortel said Videla died in his prison cell. He was found lifeless in his bed and declared dead at 8:25 a.m., according to an official medical report cited by the state news agency Telam. Videla ran one of the bloodiest military governments during South America's era of dictatorships, and later sought to take full responsibility for kidnappings, tortures, deaths and disappearances when he was tried again and again for these crimes in recent years. He said he knew about everything that happened under his rule because "I was above everyone." Some rights activists see Videla now as more of a tool than a leader, alleging that the junta served to consolidate the power of Argentina's wealthy elites. Videla had a low profile before the March 24, 1976, coup, but quickly became the architect of a repressive system that killed about 9,000 people, according to an official accounting after democracy returned to Argentina in 1983. Human rights activists believe the real number was as high as 30,000. This "dirty war" introduced two frightening terms to the global lexicon of terror: "disappeareds" — people kidnapped and never seen nor heard from again — and "death flights," in which political prisoners were thrown, drugged but alive, from navy planes into the sea. Complaints from families looking for missing loved ones were later heard internationally, revealing that a regime many Argentines initially welcomed as an antidote to political violence and economic chaos was much bloodier than they expected. "The disappeareds aren't there, they don't exist," Videla told a news conference defensively in 1977. Videla's dictatorship also stood out for its policy of holding pregnant prisoners until they gave birth, and then killing the women while arranging for illegal adoptions of their babies, usually by military or police families. This happened hundreds of times, and the Grandmothers of the Plaza de Mayo rights group has relentlessly sought to reunite these children, now in their 30s, with their biological families. Videla was sentenced to a 50-year-term for the thefts of these babies last year after some of the more than 100 people who have recovered their true identities to date testified against him. Adolfo Perez Esquivel, who spent 28 months in prison during the dictatorship and won the Nobel Peace Prize for his work documenting Videla's crimes, said his death is no cause for celebration, and urged Argentina's justice system to keep investigating the dirty war era. "The death of Videla should not bring joy to anyone. We need to keep working for a better society, more just, more humane, so that all this horror doesn't ever happen, never again," Esquivel said in an interview with Radio Once Diez. Neither does Videla's death end an era, Esquivel said: "It goes beyond Videla, it's a political system that they implemented throughout the country and in Latin America." Videla's regime, known as the "Process of National Reorganization," ousted President Maria Estela "Isabel" Peron, whom strongman president Juan Domingo Peron had named as his vice president before his death. Argentina was extremely politically unstable at the time, vexed by an economic crisis and waves of kidnappings and killings perpetrated by both armed leftists and right-wing death squads. The widow Peron had already set extrajudicial killings in motion when she ordered the military to ensure the "annihilation" of small bands of leftist guerrillas who were promoting a revolution from a mountainous hideout in Argentina's Tucuman province. By the time of the coup, these bands were no longer a real threat, but the junta intensified the deadly campaign, eliminating political opponents, union members, student activists, social workers and even priests and Catholic lay workers. It became frighteningly common for squads of thugs to close off streets and then roust people from their beds, driving them away in unmarked Ford Falcons to be tortured in clandestine detention centers. The process soon spread internationally as the junta joined Operation Condor, an effort launched by Chile's dictator, Gen. Augusto Pinochet to make sure the countries of South American's southern cone provided no refuge to each other's enemies. Paraguay's dictator Alfredo Stroessner joined the pact, as did the leaders of Bolivia, Brasil, and Uruguay. Secret documents released decades later showed that U.S. Secretary of State Henry Kissinger was kept well informed. Videla told journalists Maria Seone and Vicente Muleiro, authors of his 2001 biography "The Dictator," that the three essential elements of his state-sponsored terror campaign were clandestine detention centers, torture to obtain information and the subsequent disappearance of the prisoners, so that they "don't have identity," and are "neither alive nor dead." Videla's junta closed Congress, banned political parties, intervened in unions and universities, and imposed an iron censorship over the media. The military leaders engineered a joint venture with the owners of the newspapers La Nacion and Clarin to control newsprint and thus ensure sympathetic coverage. The high point of Videla's regime came in 1978, when Argentina hosted soccer's World Cup. Just blocks from the River Plate stadium where Argentina won the championship, detainees were being tortured inside the Navy Mechanics School, a leafy campus where thousands were taken, never to be seen again. 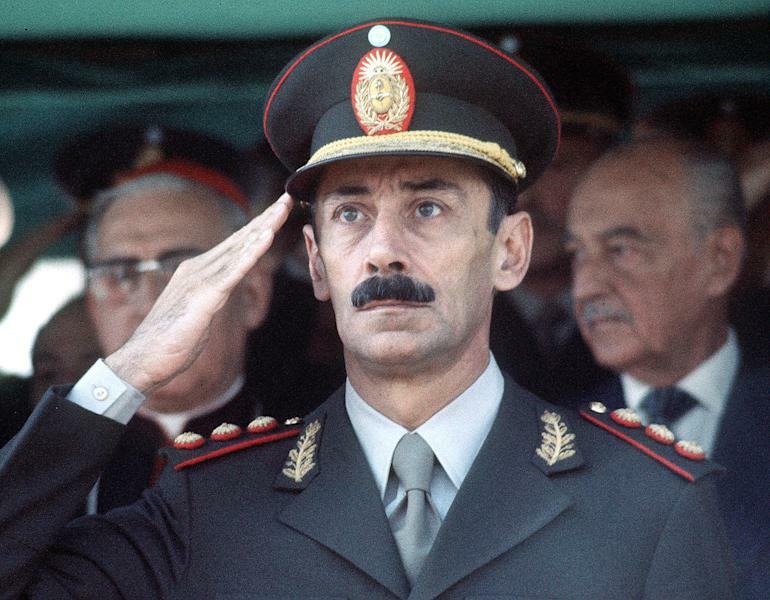 Videla retired in 1981 and handed leadership to a succession of other generals. By then the junta was weakened, pressured by persistent inflation, a sluggish economy and an explosion in Argentina's debt load after nationalizing the red ink of private corporations. The dictators then launched an ill-advised war against Britain for the Falkland Islands, which Argentina claims as the Malvinas and considers part of its territory. Argentina's defeat hastened the return of democracy on Dec. 12, 1983. President Raul Alfonsin created a truth commission to investigate the dictatorship's crimes, and its report, titled "Never Again," served as the basis for a historic trial of the junta leaders, which ended in 1985 with Videla being sentenced to life in prison and stripped of his military rank. Alfonsin's government also passed amnesty laws designed to prevent other human rights trials. But Alfonsin's successor, President Carlos Menem, pardoned the junta leaders in 1990, and Videla remained free until 1998, when a judge charged him in the baby thefts. He spent a month in prison before asserting the right Argentines over 70 have to house arrest pending trial. In 2003, during the presidency of Nestor Kirchner, the Supreme Court nullified the amnesty laws, beginning a new era of human rights investigations that finally reached the trial stage in recent years. In 2010, Videla was condemned to life in prison for torturing and killing 31 political dissidents, and was ordered to serve the time in common prison. The baby thefts conviction was added in 2012. Videla ultimately spent only five years behind bars after courts ended his house arrest in 2008. He died while standing trial for Operation Condor's kidnappings and killings. Videla's hated economy minister, Martinez de Hoz, also died, in March, while being tried for crimes against humanity. Argentina's justice system has moved slowly, but activists are proud that such dictatorship figures have been tried by civilian courts as part of a democratic process. "History will evaluate the genocide and shame of the civic-military regime Videla headed, and of which he never repented," said the Grandmothers' president, Estela de Carlotto. She predicted that Videla "won't go to heaven" because "despite what man says on Earth, he up above says something else." Videla's ancestors fought in Argentina's war of independence from Spain, and his father, Lt. Col. Rafael Videla, joined the coup that toppled President Hipolito Yrigoyen in 1930. Videla was born on Aug. 2, 1925, in Mercedes, a town in Buenos Aires province, and kept up the tradition. He became a general in 1971 and was designated army commander in 1976. He married Alicia Raquel Hartridge in 1948 and had seven children. Associated Press Writers Daniel Zadunaisky and Almudena Calatrava contributed to this story.